Here’s the interesting thing about conventional versus unconventional definitions in this industry: With the rapid pace of innovation in the Canadian oilpatch, what is considered unconventional today may very well be considered conventional, 20, 10 or even five years from now! You’ve probably heard terms like these: “conventional oil” or “unconventional gas”, but you may not be clear on what the terms mean. This issue of PatchWorks explores what’s considered “conventional” versus “unconventional” in oil and gas. Conventional oil or gas comes from geological formations that are relatively straightforward to develop – they don’t need specialized technologies to unlock their potential. Because they are easier and less expensive to produce, conventional oil and gas were the first targets of industry activity. Canada began producing conventional oil in the late 1890s and conventional natural gas in the early 1900s. By contrast, unconventional resources are trapped in reservoirs with low permeability, meaning little to no ability for the oil or natural gas to flow through the rock and into a wellbore. In order to produce from unconventional reservoirs, industry uses a stimulation technique like hydraulic fracturing to create cracks in the underground rock that allow the oil or natural gas to flow. Of course this is more time-consuming and costly than producing from a reservoir that requires no stimulation beyond a pumpjack or wellhead compressor. So if conventional resources are easy and inexpensive to develop, why are we going after unconventional oil and gas now? It’s all about supply, referred to as reserves. Canada’s oil and gas future lies with our vast reserves of unconventional resources. Take a look at crude oil reserves. Canada has 174 billion barrels of oil reserves, of which 169 billion barrels are oil sands reserves. Extra-heavy oil and oil sands are categorized as unconventional oil, along with light tight oil, also known as shale oil. Now let’s look at conventional versus unconventional natural gas. 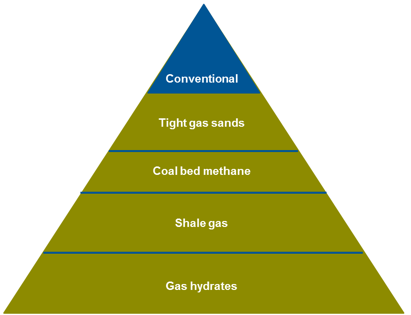 The natural gas resource triangle shown here illustrates the amount of natural gas reserves in Canada by type. It’s clear that our conventional resources (shown in blue) are by far the smallest in volume, compared to our unconventional resources (shown in green). Most importantly, whether conventional or unconventional, shale gas, tight gas, coal bed methane or gas hydrates, we are still talking about natural gas! No matter what form it comes in, natural gas is abundant, reliable, versatile and clean-burning.